Hillary Clinton, who has a net worth upwards of $50 million, said in an interview that she is "unlike a lot of people who are truly well off." Clinton was derided for comments made last week that her family was "dead broke" when it left the White House in 2000 although they were far from the poverty line. Bill and Hillary Clinton have reportedly made more than $100 million since leaving the White House. But Hillary, who charges a six figure speaking fee, says with a burst of laughter that she is not "truly well off" and that her wealth is the result of "hard work," according to The Guardian. America's glaring income inequality is certain to be a central bone of contention in the 2016 presidential election. But with her huge personal wealth, how could Clinton possibly hope to be credible on this issue when people see her as part of the problem, not its solution? "But they don't see me as part of the problem," she protests, "because we pay ordinary income tax, unlike a lot of people who are truly well off, not to name names; and we've done it through dint of hard work," she says, letting off another burst of laughter. If past form is any guide, she must be finding my question painful. 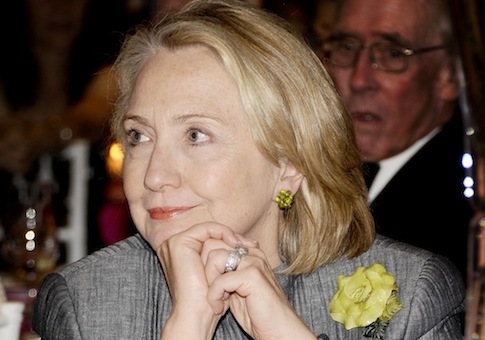 Hillary's attitude on wealth has been the target of criticism, even from the left. Howard Fineman called her "dead broke" comment "disastrous" and "offensive to even some Democrats." MSNBC's Chuck Todd said that Hillary comes off as a "politician who perhaps only hangs out with millionaires and donors and feels poor by comparison." This entry was posted in Politics and tagged 2016 Election, Hillary Clinton. Bookmark the permalink.